There are lots of different rail travel, e.g. Regional Services, Inter-city Routes and High-Speed Services. Reginal Services- These are trains that operate between towns and cities. These trains are faster and have less stops than inner city routes, these trains normally run with an even service everyday although some might be increased during rush hour. A train from Bolton to Manchester would be an example of Reginal Trains, they run every 20 minutes regulary. Inter-City Routes- Inter City Route Trains are trains that cover longer distances that Reginal Serviced Trains. They are also known as 'express trains' with limited stops and comfortable carriages to serve long-distance travel. An example of this would be a train that runs from Manchester to London. High- Speed Services- These trains operate significally faster than a Reginal Serviced or an Inter-City Route train. High-speed trains travel at their maximum speed on specific tracks, using the normal tracks. 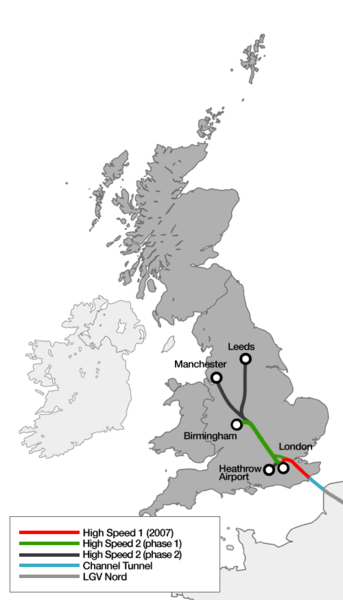 The map below shows the 4 main High-Speed Serviced Trains in the UK.